I recognize that it’s a little on the late side for many of you to cook this for Cinco de Mayo. I have heard rumors, however, that in some parts of Texas, Cinco de Mayo has been rescheduled for September due to concerns over swine flu. They’re also planning to push back the 4th of July to November. Regardless of when you celebrate Cinco de Mayo, or whether you celebrate Cinco de Mayo, this dish is worthy to add to your repertoire. I got the recipe from my mother, who is a source to be reckoned with. She works full time, has written several books, travels the world on a regular basis (I think right now she’s somewhere in the Aegean) and still manages to cook dinner nearly every night (skipping the nights on the Aegean). So you know that any recipe that comes from a woman like this is 1) simple to prepare, because she does not have TIME for excessively complicated dishes and 2) delicious, because she has high standards. You poach chicken in a mixture of green salsa and chicken broth, then chop or shred the chicken, add some sour cream to the sauce, and layer it in a casserole dish with some tortilla chips, shredded cheese and cilantro. Then you bake it. The result (if you’ve never had chilaquiles) is a casserole with a good corn masa flavor (the tortilla chips are moistened by the sauce and become more like tortillas), a nice piquant hit from the salsa mellowed by the richness of sour cream, and melted cheese. Which is ALWAYS a good thing. It really is a snap to put together (it lives in both my and my mother’s recipe files under the title “Easy Chicken Chilaquiles”) and tastes like more than the sum of its parts. Combine the salsa and chicken broth in a saucepan and poach the chicken (cook at a simmer) until the chicken is cooked through (about 10 minutes). Remove the chicken and shred or chop. Add sour cream to salsa mixture and blend thoroughly. 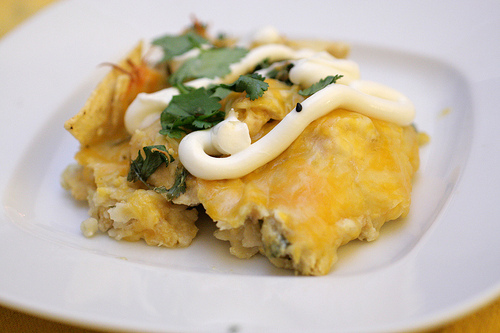 In a 9X13 baking pan, layer (in 2 layers) the chips, chicken, sauce, cilantro and cheese. Bake at 350 for 30 minutes. Looks so easy and delicious! I’m totally tucking it away for future reference. Looks so good! If you don’t mind, I’m going to add this to my files to use as one of my suggested meals, with credit to you/your blog of course! Oh this looks great and I always have these ingredients on hand! Perfect. This looks and sounds SO EASY! I love Mexican food but it’s often so heavy. This looks just right. And I can’t believe Texas is postponing holiday celebrations – is that for real or was it a joke!? These were awesome, KC–half the pan disappeared in about 15 minutes or something. Cy had thirds! I made this for my fussy family of six and they gobbled it up! I will definitely make it again and again, thank you!